The Cat flea is the main focus for flea control in Portland and the Pacific Northwest. Because cats and dogs have higher body temperatures than humans, these fleas generally prefer the animals. Women and children can be warmer and can become the preferred target over the men in the family. When fleas bite people, the resulting reaction is usually quite itchy and the bite can become infected. Adult fleas are not only a nuisance to humans and their pets, but can cause medical problems, including flea allergy dermatitis (FAD), tapeworms, secondary skin irritations and, in extreme cases, anemia. 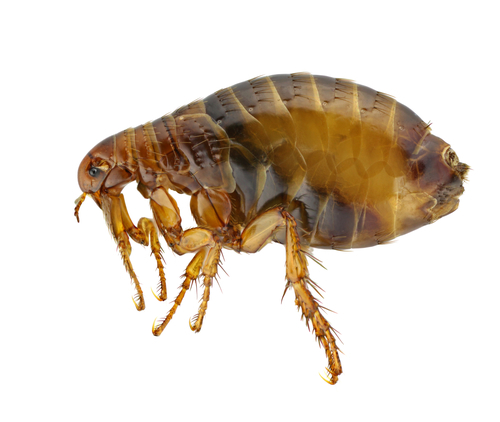 Adult fleas may live from two months to one year in the pupal cocoon without feeding, so there is often a desperate need for flea control after a family has returned from a long vacation, or after a pet leaves the home for extended periods. This is when Nature First Pest Control gets a call. Adult fleas develop inside a pupal cocoon and remain in a kind of “limbo” until a blood source is near. Waiting hungry hordes of fleas in pupae can hear the noise of the family returning from vacation, and attack within minutes. Should we banish the pets from the house? Should the pets be treated and with which product? How soon can you expect relief? Flea control is best achieved with a simultaneous, coordinated effort that includes home preparation, premise treatment and pet treatment. Most of the flea eggs, larvae, pupae and adults will be found in your pet’s favorite resting and sleeping areas. Flea eggs and blood excrement droppings are not sticky. These small grains are often called ‘Salt and Pepper’ due to their appearance. They are often found in small cracks in flooring and under appliances. If your infested dog or cat sleeps on your bed, the ‘Salt and Pepper’ gets thrown to the floor when you get up and becomes concentrated in the area right around your bed. Vacuum the entire floor including the hardwood areas. Move the refrigerator, and the washer and dryer. You can pull off the bottom kick plate on the dish washer and use a wand to vacuum the hard to reach areas. It is important to pull the covers off the floor vents and use the wand and hose to vacuum the ducting as deeply as you can reach. Remove the sofa and chair cushions and kneel on the deck to access the gap where the Fritos, pocket change and flea eggs fall into. Remove all toys, rugs, and clutter from the floor and put them on the beds or tables. Be sure to point out to the Nature First Pest Control technician the places where the animals spend most of their resting time. Nature First Pest Control is happy to provide more detailed information, including a pre-treat checklist, when you call. Green Eco-friendly Pest Control using Sustainable, Organic, Natural and Green methods. We safely eliminate Fleas in and around Portland Homes and Businesses. We are the leader in Natural and Organic Pest Control in Portland. We always try to exterminate naturally.